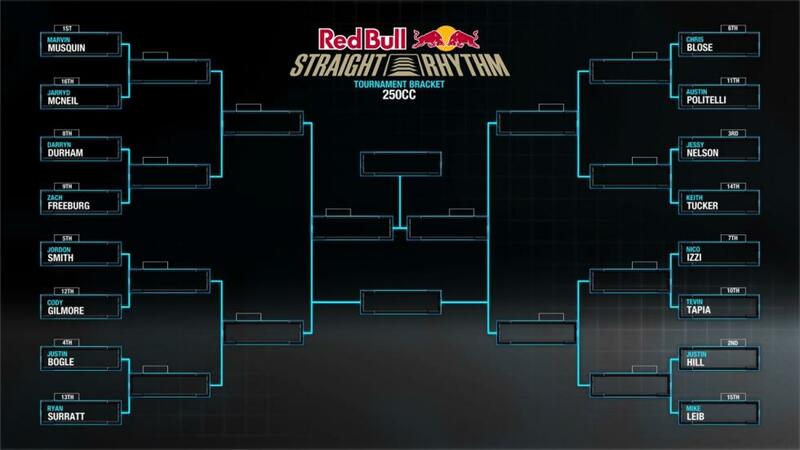 When Red Bull's Straight Rhythm first hit the internet almost a year ago it made quite an impression, and it seemed pretty apparent that it wouldn’t be the last time we’d see the the concept of an unwound supercross track in action. That day has arrived, only instead of an exhibition it’s a full on competition taking place at Auto Club Raceway at Fairplex in Pomona, CA. We’ll be bringing the action from the half-mile course to you right here on the Race Day Feed, so be sure to check back frequently as the race unwinds. You can also check out the live feed right here. As you might expect, racing on a track without turns is a whole new ball game, but riders are beginning the understand how it's played. We saw huge variations on times during Friday's first practice runs, but the field is starting to tighten now that the fast lines and rhythms have been established. 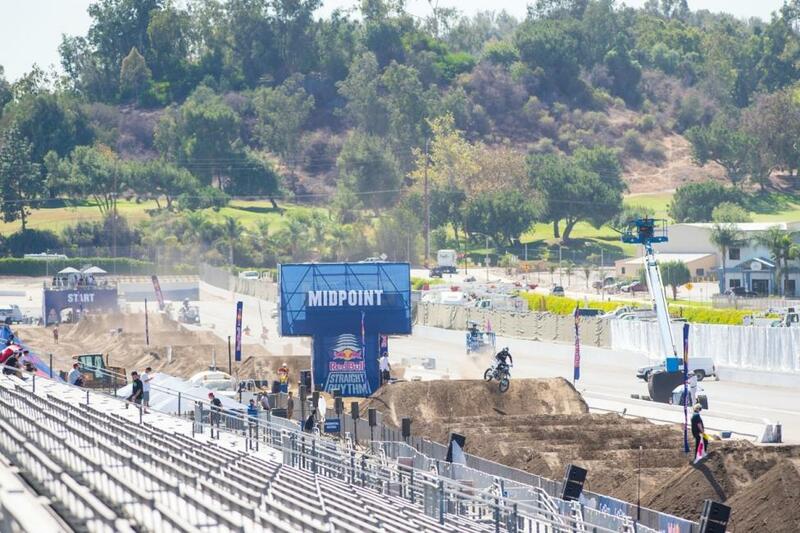 The lap times hover around the 50-second range, similar to a regular supercross track. Of course, without turns, they're going faster over a longer distance, and a few mentioned grabbing fourth gear and pinning it on a 450, which they don't ever do on a track with turns. Ryan Dungey and Josh Grant have pulled out of Red Bull Straight Rhythm and have been replaced by Scott Champion and Vince Friese. The toughest part of the track is the very first rhythm section, and nailing those jumps with perfect timing could change everything. Plus, riders have to take on a small set of whoops right out of the starting gate, so they're grabbing gears while also preparing to hit obstacles. The rest of the track is a little less technical but faster, including a sand section, five-straight on off tables, and a ten pack of jumps that can be taken in a variety of double-triple patterns. But, in talking to riders and teams, it seems most will figure out the best combos, and the race will come down to tenths of a second--scrubbing harder, hanging it out more and figuring out a way to push harder. The races should be close and pretty exciting if it turns out that way. Today’s competition is separated into two classes, 250cc and Open, and each matchup consists of three, one-on-one races. For a racer to win his bracket and move on to the next round, he’ll have to win two of those three races. In other words, if a rider makes a mistake in one race he’ll have another chance to come back in the next. James Stewart set the fastest Open Class time during qualifying. 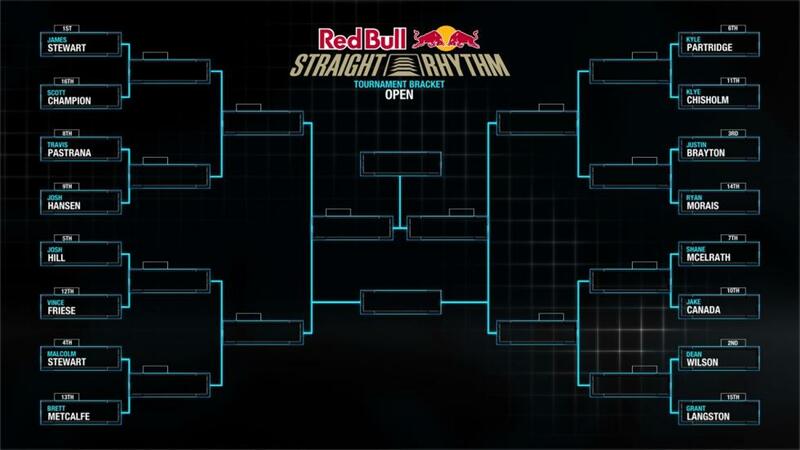 The initial matchups were determined by qualifying, with the fastest rider in each class going up against the slowest, second fastest against the second slowest and so on. James Stewart and Marvin Musquin were the fastest qualifiers in their classes, and veterans Grant Langston and Travis Pastrana, who is racing a 500cc two-stroke, looked fast too—if you didn’t know any better you’d never guess that they’ve both been retired for quite some time. Check out the pictures below to see who will be going up against each other first.